An initiative of HG Naru Gopal das, CEO of ISKCON Mayapur, who has been working over these years to start a full fledged Music School in Sri dham Mayapur to facilitate the devotees worldwide and Mayapur community to learn to play musical instruments. Whenever any devotee visits Mayapur, they always have a list of to do things in Mayapur – Dham darshan, seva for deities, study Bhakti Sastri courses and do deity worship course. To learn to play kartal, Mrdanga and harmonium is a major item in the wish list and often we see in the parks, the devotees learning these skills from local kirtaneers. With the inauguration of new Bhakti Vedanta Music School, devotees from around the world can systematically learn to play musical instruments. HH Bhakti Charu Swami, HG Jananivasa Prabhu, HG Pankajanghri prabhu and Umapati Maharaj graced this auspicious occasion. An initiative of HG Naru Gopal das, CEO of ISKCON Mayapur, who has been working over these years to start a full fledged Music School in Sri dham Mayapur to facilitate the devotees worldwide and Mayapur community to learn to play musical instruments. Pankajanghri prabhu, blessing the inauguration, said that ISKCON is an educational institution. All branches of knowledge should be imparted and now, with the opening of Bhakti Vedanta Music School, there is a facility for everyone to gain knowledge of musical sciences. He recalled his early days, when he wished to go to Mayapur, his temple president asked him what he would do in Mayapur? Prabhu replied that he will fetch water from Ganga for Sri Radha-Madhava and learn to play Mrdanga. But he couldn’t do the latter as this school was not there thirty years ago. HG Jananivasa prabhu thanked Narugopal prabhu for his endeavor to start this music school in Mayapur. He added that it is apt to have HH Bhakti Charu Swami and Narugopal prabhu on this inaugural day as they both are accomplished musicians and singers like gandarvas. He said, ‘This is the speciality of Gauda bhaktas. They are expert in music and use it in the service of the Lord. I will also visit this school some time to learn some beats in kartal as I know to just do simple beat in kartal’. Prabhu wished all success for this Music School. Blessing the occasion, HH Bhakti Charu Swami said, ‘Sri Caitanya Mahaprabhu movement is based on Sankirtan. Many of the associates of Mahaprabhu are musicians. They sing for hours together for the pleasure of Sri Caitanya Mahaprabhu. This is evident from the songs of Padyavali. These songs are full of classical music-sastra sangeet. Later on the classical music was influenced by Muslim invasion. When the emotions of the heart are expressed in words, it is called song while when they are expressed through bodily movements, it becomes dance. So, the purpose of music is to glorify the Lord. ISKCON has got a solemn responsibility to reestablish this purpose. We have to train our children in arts and culture so that they can express Krishna Consciousness in a way to attract the whole world. We are grateful to HH Bhakti Vidya Purna Swami for training young boys in music, cooking and in philosophy. Under the guidance of HH Bhakti Purusottama Swami, Sankarshan Nitai Prabhu and the principal, Bhakti Vedanta National School students are well trained in art and culture. Mayapur was the center of learning in those days. ISKCON Mayapur is making it happen again by establishing several educational institutions in Mayapur like Gurukula, Mayapur Academy, Mayapur Institute and now the music school.’ He felt the present premise is small for the school. He blessed the school all success to grow into a bigger institution. Speaking on the mission & vision of Bhakti Vedanta Music School, Narugopal prabhu expressed that the responsibility rests on devotees to work hard and take advantage of this music school. They are planning for a new syallabus common to all the schools in Mayapur. 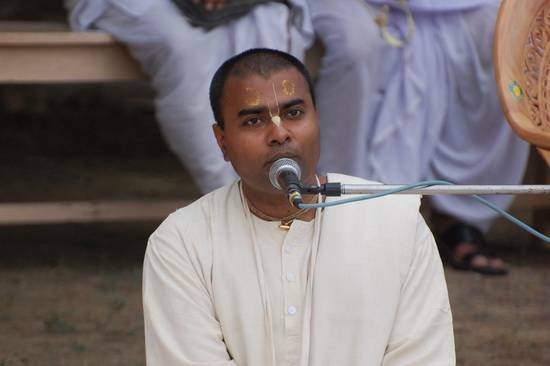 He welcomed Mayapur community, brahmacahries and students to take this opportunity very seriously to learn music. Expert teachers have been appointed to give training. Devotees can learn to play Mrdanga, harmonium, kartals and sitar in a very systematic manner. The school will strive hard to establish the glory of Navadvip once again as a seat of learning. Everyone congratulated Venudhari prabhu of Sankirtan department for his efforts in establishing this school. The program ended with sumptuous prasadam distribution.